This is a scalable context timeline. It contains events related to the event May 12-13, 1997: Prosecution’s ‘Star Witness’ Testifies in Oklahoma City Bombing Trial, Says McVeigh Intended to Trigger ‘General Uprising’ in America. You can narrow or broaden the context of this timeline by adjusting the zoom level. The lower the scale, the more relevant the items on average will be, while the higher the scale, the less relevant the items, on average, will be. Michael Fortier. [Source: Indianapolis Star]Future Oklahoma City bomber Timothy McVeigh (see 8:35 a.m. - 9:02 a.m. April 19, 1995) travels to Kingman, Arizona, to move in with his old Army friend Michael Fortier (see March 24, 1988 - Late 1990, November 1991 - Summer 1992, and March 1993) in Fortier’s trailer home, where he tells Fortier he intends to carry out some unnamed violent action against the government in response to the Branch Davidian tragedy (see April 19, 1993 and After). McVeigh briefly works as a security guard for State Security. Fortier will later recall, “I thought he was still in the Army when he showed up at my door,” noting McVeigh’s tight blond crewcut and his camouflage clothing. “When you saw him, it was like he never left. Actually, I never thought he would leave the service. It was just him.… I have to say McVeigh was a good soldier, a much better soldier than I ever was. His shoes were always spit shined and his clothes always pressed. I would put them on straight out of the dryer.” When they first met in the Army, Fortier will recall, he did not like McVeigh, who is from upstate New York (see 1987-1988). “He had this real New York attitude, real rude and blunt,” Fortier will recall. “He just had no tact.” But, he will continue, “you just got used to his attitude.” Staff Sergeant Albert Warnement, another member of the same company who also sometimes went shooting with McVeigh on the weekends, will later recall, “Fortier was probably his best friend.” Fortier’s mother Irene Fortier has a different recollection of McVeigh, remembering him as “polite and courteous.” McVeigh and Fortier share a dislike of the US government—in the front yard of his trailer, Fortier flies both an American flag and a “Don’t Tread on Me” flag often connected with right-wing militia groups—and a fascination with weaponry. Fortier keeps a half-dozen or more guns in his home, as is commonplace in many northern Arizona homes. McVeigh tells him it is time to take violent action against the US government (see August 21-31, 1992). McVeigh stays in Kingman for around five months, though he soon moves into a rented trailer in the Canyon West Mobile and RV trailer park, and gives Fortier’s address as his residence on an application to rent a private mail box, #206, at the Mail Room (see February - July 1994) under the alias “Tim Tuttle” (see October 12, 1993 - January 1994). 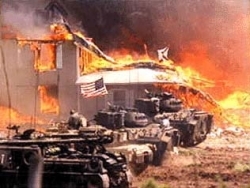 He and Fortier discuss forming a militia to fight the “New World Order” (see September 11, 1990), which, they believe, is represented by the government’s fatal assault against the Branch Davidians near Waco, Texas (see April 19, 1993 and April 19, 1993 and After). [New York Times, 5/6/1995; New York Times, 5/21/1995; Stickney, 1996, pp. 151; PBS Frontline, 1/22/1996; Serrano, 1998, pp. 79; Douglas O. Linder, 2001] During the first weeks of his stay at the Fortiers’ home, McVeigh visits his friend Roger Moore, an Arkansas gun dealer (see March 1993). At some time during his stay, he uses methamphetamines, probably obtained from Fortier and in the company of Fortier. He writes his father Bill during this time and asks him not to divulge his address. [PBS Frontline, 1/22/1996] In October 1993, McVeigh leaves Arizona to move in with another Army friend, Terry Nichols (see October 12, 1993 - January 1994). Concealing Blasting Caps, Going to Pick Up Stolen Weapons - McVeigh comes to Fortier’s Kingman, Arizona, home from New Mexico, and meets the Fortiers at the local Mohave Inn. Lori Fortier wraps two boxes of blasting caps stolen by McVeigh (see October 4 - Late October, 1994) in Christmas wrapping paper. 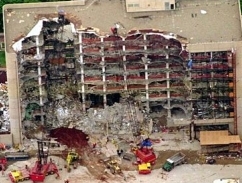 The plan is for McVeigh and Michael Fortier to drive to Oklahoma City in McVeigh’s car to scout the Murrah location, then drive to Council Grove, Kansas, to pick up weapons McVeigh says his friend and fellow conspirator Terry Nichols stole to help finance the bombing (see November 5, 1994)—adding that he wishes Nichols had killed the victim of the robbery, Roger Moore, when he stole the weapons. In Council Grove, they will rent a car. Fortier will take the weapons back to Arizona in the rental and sell them. McVeigh will drive north with the blasting caps. Fortier will later say he is more interested in the weapons than he is in any bombing plot, as McVeigh says he can have half of the profits from their sale. Both Fortier and his wife later say that Fortier has no intentions of joining McVeigh in carrying out any violence. Discussions of Bombing Plans - During the drive to Oklahoma City, McVeigh and Fortier pass a large Ryder storage truck, and McVeigh tells Fortier he wants to use a truck similar to that for the bombing, but a size larger. Nichols has already decided against targeting a federal building in Kansas, and McVeigh and Nichols have determined that no federal building in Dallas would serve as a good target, so the Murrah Building in Oklahoma City is the best choice, McVeigh says, in part because he believes (erroneously) that the building “was where the orders for the attack on Waco came from” (see April 19, 1993 and April 19, 1993 and After). He also confides in Fortier that he believes his attack will mark the first shot in a general anti-government, white supremacist uprising similar to that depicted in his favorite novel, The Turner Diaries (see 1978). When they arrive at the Murrah Building, they drive around the building twice. Fortier observes that the elevator shaft in the building might stop it from collapsing entirely. They stop in the parking lot and look at the building from several angles; after about 20 minutes, a nervous Fortier tells McVeigh, “Let’s leave.” McVeigh says that he is considering remaining inside the truck after parking it outside the Murrah Building and setting the fuse. A shaken Fortier says that would amount to “suicide,” but McVeigh, Fortier recalls, replies that he may decide to “stay inside and shoot anyone who tried to stop him.” McVeigh shows Fortier an alley behind the YMCA building across the street in which he can hide a getaway car. He is also mulling over having their mutual friend Terry Nichols “follow and wait” for him, presumably to help him escape the scene of the blast. McVeigh shows Fortier the loading zone for the Murrah Building, a good place, he says, to park the bomb-laden truck. According to Fortier, McVeigh is also considering driving “the truck down the stairs and crash[ing] it through the front doors.” McVeigh complains about Nichols, whom he calls “the old man,” apparently showing signs of backing out of the plot. Nichols’s waffling is part of the reason McVeigh is interested in soliciting Fortier’s involvement. Michael Fortier, a friend of convicted Oklahoma City bomber Timothy McVeigh (see May 19, 1995, August 8, 1995, and May 12-13, 1997), testifies against McVeigh’s alleged co-conspirator Terry Nichols (see 8:35 a.m. - 9:02 a.m. April 19, 1995 and November 3, 1997). Fortier tells the jury that Nichols and McVeigh took him to an Arizona storage locker filled with explosives seven months before the bombing (see October 4 - Late October, 1994). Fortier has pleaded guilty to four felonies related to the bombing. Says He Refused to Take Active Part in Bombing, Says Nichols Withdrew - Fortier testifies that McVeigh asked him to rent a storage unit under a false name, but Fortier did not do so. He also testifies that McVeigh asked him to join him and Nichols in the bombing, but Fortier says he refused (see October 21 or 22, 1994). Later, Fortier says, McVeigh told him that Nichols “no longer wanted to help him mix the bomb” (see March 1995), testifying: “Tim told me that Terry no longer wanted to help him mix the bomb. He told me that there was some problem between—or the problem had to do with Terry’s wife, Marife. I asked Tim what he was going to do if Terry didn’t help him. I made a joke and said: ‘What would you do? Would you kill him if he doesn’t help you?’ And he answered me seriously and said he would not do that. And he went on to say that Terry would have to help him because he’s in it so far up till now.” Fortier identifies a length of explosives brought to his home for safekeeping by McVeigh as being from one of the Arizona storage lockers; an FBI expert, testifying immediately after Fortier, identifies a fingerprint on the wrapper for the explosives as belonging to Nichols.